With just over 6 months until the launch of Royal Caribbean’s latest mega-ship, Harmony of the Seas, the cruise line has released an illustrated graphic demonstrating just how big the new vessel will be. To put the ship’s 361m (1,181ft) length into perspective, Royal Caribbean pitted its proportions against some of the world’s most recognisable landmarks – including Big Ben, the Eiffel Tower, the Leaning Tower of Pisa and Dubai’s Burj Al Arab – to give prospective cruise-goers a better idea of the ship’s imposing scale. Dwarfing Paris’ famous tower by 37 metres and towering eight times taller than Rome’s historic Colosseum – Harmony of the Seas will prove a rousing spectacle when it is launched in May 2016. On paper, Harmony of the Seas is already proving itself as the next ocean-bound record-breaker. 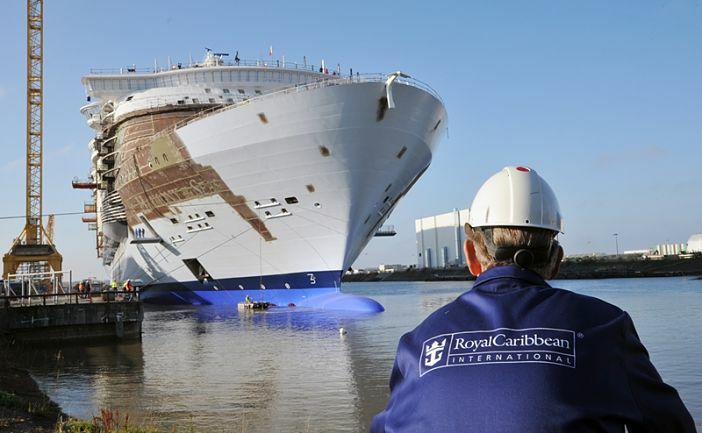 Upon its launch, it will become the world’s largest cruise ship – trouncing fellow Oasis Class vessels, Oasis of the Seas and Allure of the Seas, by several square millimetres. Not only that, but it’ll carry a record breaking number of passengers – 5,497, to be exact. Sheer scale isn’t the only area in which Harmony impresses, either. Following the success of RC’s Quantum Class vessels, it was decided the line’s latest Oasis Class ship should be loaded with similar high-tech features and amenities – including interactive WOW wristbands and a fully automated bar manned solely by robots. Harmony of the Seas will make her anticipated maiden voyage from Southampton in May 2016, before travelling to her homeport of Barcelona where the ship will offer an exciting range of itineraries throughout Europe. To keep up to date with the latest news and information surrounding Harmony of the Seas prior to her maiden sailing, be sure to check back with Cruise1st Australia regularly for the latest updates as they develop.